PHILADELPHIA -- After Bryan Bickell put such a memorable end to his hockey career, it was hard to find a dry eye in the Carolina Hurricanes' locker room. Bickell scored in the shootout of his final game before retiring because of multiple sclerosis, and the Hurricanes beat the Philadelphia Flyers 4-3 Sunday night in the season finale for both teams. "I think I sweated all the tears out, so I don't have much left," Bickell said after receiving countless handshakes and hugs from teammates. "It's been an emotional week leading into this day. Seeing my family here, all the people that supported me through it all, I'm just happy." Thanks to @NHLCanes @NHLBlackhawks for letting a kid from Orono Ont live this hockey dreams and 2 all the people that helped me get there. During a stoppage in the first period, fans and players from both teams gave Bickell a standing ovation and stick tap. The 31-year-old three-time Stanley Cup champion was diagnosed with MS in November but returned to hockey in February. He decided earlier this week to retire while he fights the disease. His shootout goal was the first of his career in his second attempt and set up Brock McGinn's winner on the final shot of Carolina's season. McGinn also scored twice in regulation. After the game, Carolina coach Bill Peters said he regretted not selecting Bickell for shootout against the St. Louis Blues on Saturday night and made up for it by having Bickell take the first shot of the shootout against the Flyers. "Thank God it worked out," Peters said. "I was a little disappointed in myself for not being on top of that. Usually, I'm a little keener in that situation. We were lucky to get a second chance at it. I'll never forget his goal, the reaction from his teammates and the emotion he had." It was quite the night for Bickell, who had his wife and daughter watching from the stands. 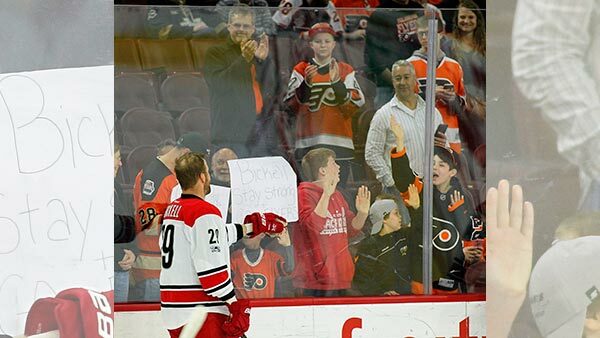 "Seeing the Philly fans show that kind of respect by giving me applause, that was nice," Bickell said. Bickell's farewell came in an otherwise meaningless game between two teams who fell short of preseason expectations to reach the playoffs. Sebastian Aho sent the game into overtime when he scored a power-play goal with 5:10 remaining in regulation. Eddie Lack stopped 41 shots for the Hurricanes, who finished the season 36-31-15. Dale Weise scored a pair of goals and Wayne Simmonds netted his team-high 31st for the Flyers. Rookie goaltender Anthony Stolarz stopped 32 shots. The Flyers finished the season with a 39-33-10 record. The Hurricanes have missed the playoffs eight straight seasons, including the last three under head Peters. The Flyers have missed the playoffs three times in their last five years. Philadelphia reached the postseason last year under first-year coach Dave Hakstol but was eliminated in the first round by the Washington Capitals. "It was very frustrating," Flyers captain Claude Giroux said. "Some games during the year we had a lot of confidence playing our game and if we would have played like that the whole year we would have been more successful than we are right now. But at the same time, I really think we're going in the right direction and we have a lot of pieces here." McGinn put Carolina up 5:42 into the first, and Weise tied it 8:46 into the second. The teams then alternated goals in the third period, with McGinn and Weise again scoring in succession before Simmonds' go-ahead goal with 7:55 left and Aho's tying tally. NOTES: Rookie C Mike Vecchione, signed by the Flyers on March 31 after becoming a Hobey Baker finalist at Union College, played in his second NHL game and first in Philadelphia. ... Jakub Voracek finished the season as the Flyers' point leader with 61 (20 goals, 41 assists). Jeff Skinner led the Hurricanes with 63 points (37 goals, 26 assists).